The provincial snowmobile trail system operated by members of the Ontario Federation of Snowmobile Clubs (OFSC) is now closed for the season. “Please avoid taking any foolish risks – for your own safety keep your sled parked until trails open again next winter,” says the OFSC. The provincial trail closure means that grooming operations have ceased, regional trail connections are shut down, gates are locked and signs are being taken down. The snow base on most trails has disappeared entirely or has deteriorated to the point of being unsafe to ride, leaving many hazard exposed, including rocks, stumps and bare ground. All ice is now becoming too unstable to support sleds or has melted away to open water. Spring runoff and flooding is underway, making trails impassable, breaking trail connections and resulting in extreme danger. 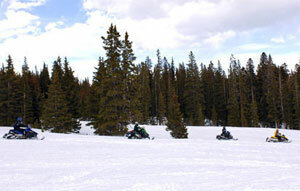 The OFSC also cautions snowmobilers that off-trail locations and conditions are now unsafe for riding, including roads and open fields.